This thread is for discussion and improvement of the SkyrimPrefs INI Guide on the wiki. This guide should not be mistaken for the Skyrim Configuration Settings Guide. It complements the Skyrim INI Guide on the wiki. Perhaps tweaking the following settings may help in SkyrimPrefs.ini. The values are the defaults (try increasing the tree ones perhaps). All these settings have to do with the full model and the object detail fade. Some full trees have branches fade out. I already mentioned those settings earlier. The ones with "tree" raised to > 4096 * 1/2 ugrids will make sure full model trees don't turn "skinny" at medium distance inside the ugrids. They will not change the fact that the 3D LOD tree models do not match if used with non vanilla trees. Also they won't change the behavior of the engine showing both full and LOD models for a time. The engine has to wait for all full models with LOD flag to load before turning the LOD off for a cell - since LOD objects are combined into one big model it doesn't know individual LOD models. If it wouldn't wait there would be a second of missing objects. Ok, so this is definitely a WIP. I have tried my best to get a comprehensive list of all possible ini tweaks in this guide for SkyrimPrefs.ini, both working and non-working. My methodology was simply to change every value in Tannin's Configurator plugin, and parse the resulting SkyrimPrefs.ini file to get most of the settings. Then I went through the low, medium, high, and ultra presets and added all their values in, including a few additions of potentially non-working INI tweaks included in them. Please edit away at this, and bless the developers of NotePad++ for their excellent find and replace functions that coded most of this guide. I have also verified that iPresentInterval has no effect inside SkyrimPrefs.ini, and must indeed be set in Skyrim.ini to have any effect. However, the default is 1, so it makes no difference unless you wish to disable it. Also, it was previously theorized that higher values such as 2 could have a different effect since this parameter accepts an integer value. However, higher values merely seem to disable it from my experiments. Please refer this post to Tannin. He helped confirmed the game misplacing iPresentInterval when Z and I were doing all that testing for it. He'll be able to help confirm these as well (hopefully) and update the Configurator. Thanks for creating the INI guides! The existing "Skyrim INIs Guide is for use with the STEP Guide. It contains transclusion tags that transclude relevant peices into the main guide. It may be wise to move these pages underneath the new INI guides and transclude from there though so that it is all together. Be careful though and note how the transclusion is working (I can work on this too at some point). Regarding the new guides you made ... the main page formats and categories are correct, but if you could move all settings to subpages under subcat "INI Settings", that would align with the ENB INI guides and categorize everything consistently (see cats fop examples). Again, I can help with this if you are not inclined. I was waiting until I got a solid basis for these guides before moving them to subpage format. It should be an easy process, as I set it up using the header format of the ENB INI guides. I want to confirm completely that the above parameters are indeed supposed to be in skyrim.ini first, then study the shadows. There are so many conflicting ideas about what these settings do that it is crazy. Now you know my pain with the ENB INI Guides. Haha! There's the shadow thread in the Guides forum that should be helpful. I can definitely confirm that iRadialBlurLevel does nothing in-game inside SkyrimPrefs.ini, but I have no idea what it does do. The setting doesn't change the radial blur when set in-game (easiest to test is coc qasmoke and activate an enchanter's table), although enabling and disabling radial blur in-game works perfectly. Changing the INI setting inside SkyrimPrefs.ini does not affect the blurring, and changing it to anything other than the default 0 in Skyrim.ini results in perfectly reproducible CTD upon activation of the radial blur. Since that action should happen as well if it were set in SkyrimPrefs.ini, I conclude that it does nothing, and indeed may be entirely broken. 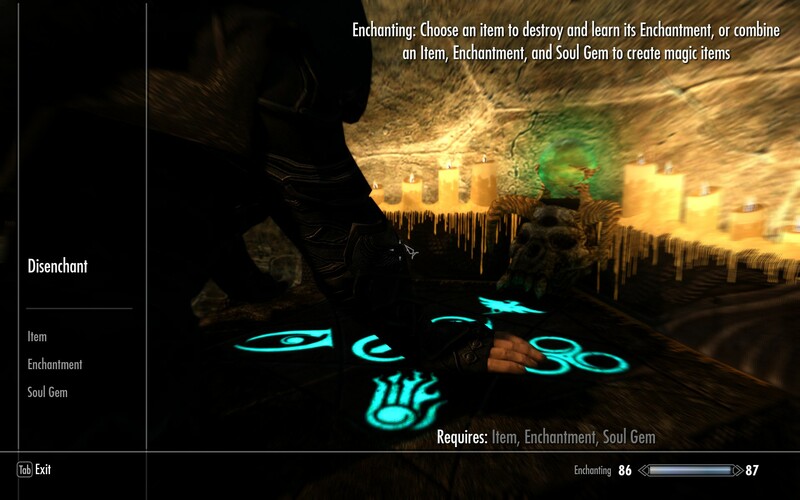 Can someone test the following settings in Skyrim.ini and NOT CTD when activating an enchanter's table? The first screenshot is taken with bDoRadialBlur=0 and you can see the candles are in focus. The second screenshot is taken with bDoRadialBlur=1 and you can see the candles are blurred. It is rather interesting that setting iRadialBlurLevel to something other than zero causes Skyrim to crash, though. To be completely honest, the only values of iRadialBlur I used were 0, 1, and 2. That is the exact same behavior I received. It would seem there is only one level of radial blur that actually works: on. I tried negative values in addition to positive integers, and all CTD if not at the default. Thanks for the screens. I may use them for bDoRadialBlur. You and I are both running AMD graphics. Could someone with an Nvidia card test it and confirm that this isn't a graphics card difference? If changing iRadialBlurLevel always produces CTD, it will get a big fat warning of NO TWEAKING in the guide. I'm running a nVidia card and I can CTD when following your test settings. @Tannin did a whole lot of tests earlier this year with settings appearing in Skyrim.ini when they should be in SkyrimPrefs.ini, and vice versa. Are you using the settings as they appear in the MO INI Editor as a base? No [Imagespace] settings were in my Skyrim.ini but I did have minimal in my SkyrimPrefs.ini. Really great work, DY, especially with your extremely thorough testing standards. Maybe it's just my eyes, but the red text on the dark gray background is really difficult to read. Maybe another warning text color would be better? I think the description for iShadowMapResolutionPrimary/secondary is partially wrong. I've had these lines in my inis both by default and when generated by the launcher every single time. It's not very important since they don't do anything anyway though. Actually you are somewhat correct. The values are never added by the launcher or in game-generated INIs, but they do appear in the stock Skyrim_default.ini and Skyrim\SkyrimPrefs.ini files that ship with the game but are never seemingly used, which I cannot seem to find a single use for in any game operations, but there could be. My theory is that people looked at these files and found the settings and thought they did something (or maybe they indeed did something at some point) and then started broadcasting them. What is certain and important now is that they do not work and are not recognized by the game.